Ask any pool owner what is the most essential pool accessory to get, and they will all tell you the same thing: a pool cover. Indeed, owning a swimming pool without a pool cover is very much like living in a house without a roof. In this article, you’ll learn essential pool cover basics like, the different pool cover types, and how to care for them. One of the biggest benefits of getting a pool cover is that it keeps leaves, twigs, dirt, and other types of debris out of your pool. That means that you not only spend a lesser amount of time cleaning your pool, but you will also need to clean your pool less frequently. The water levels of your swimming pool can still decrease even if you’re not using it through a natural process called evaporation. The evaporation rate of your pool’s water greatly depends on the humidity, wind speeds, and outside temperature. To make sure that the water of your pool at just the right level, you will need to replenish the water here on a regular basis. Of course, when you refill the water of your pool so that it’s at the right level, that would also mean that your pool’s water chemistry will also need to be adjusted to make sure that it’s not too concentrated or diluted. Installing a pool cover when you’re not using it can help slow down your pool water’s evaporation rate. That means you will need to adjust your pool water’s level and chemistry less frequently compared to if your pool is exposed to the elements; so you don’t need to spend so much on pool chemicals nor worry about increasing water bills. Leaving your swimming pool exposed to the elements not only increases the water’s evaporation rate, but it also causes the temperature of your pool’s water to drop faster. As the water in your pool evaporates, heat energy is lost. To maintain your pool’s water at an ideal temperature, you will need to turn on your pool heater. That means that your electricity bill will spike up if you’re using an electric-powered pool heater or consume more fuel. Covering your pool when you’re not using it helps regulate the temperature of your swimming pool’s water. As a result, you’re able to lower your heating expenses by as much as 50%. Winter and swimming pools are like oil and water: they don’t mix. Covering your pool during the winter season can help protect your swimming pool from damage caused by the freezing temperatures. According to the US Center Disease Control and Prevention, drowning is the second leading cause of death among children under the age of 15. Of these, 80% happen in residential swimming pools and spas. Swimming pool covers are required by the American Society for Testing and Materials (ASTM) to be able to withstand at least 485 pounds per 5 square feet. That means that it can easily support your child if he or she accidentally falls into your swimming pool when it’s not in use. Now that you know the benefits of investing in a swimming pool cover, the question is which one should you get? There are four different kinds of pool covers that you can choose from: solar, thermal, automated, and winter pool covers. Each of these pool covers has its advantages and disadvantages. Solar swimming pool covers are called as such because they absorb the heat of the sun during the day and keeps this warmth well into the night, helping to regulate your pool water’s temperature. 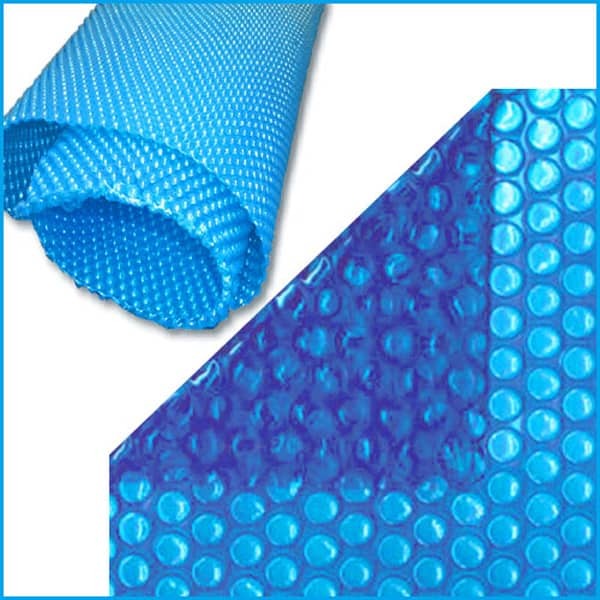 These are sometimes called bubble covers because they are made up of light, but durable, material that consists of air bubbles. Compared to the other types of pool covers, solar pool covers are the least expensive. They can fit any pool size or shape. Solar pool covers are also very efficient in reducing your pool water’s evaporation rate. The biggest advantage that solar pool covers have over the others is that they double up as pool heaters. As it absorbs the heat from the sun’s rays during the day, it transfers this heat energy to the water in your swimming pool, causing its temperature to rise by as much as 8 degrees. Installation and storage are among the biggest challenges that you’ll face with solar pool covers. Solar pool covers can be quite difficult to place and take off without a cover roller.Also, because it’s extremely lightweight, solar pool covers cannot fully support the weight of a small child on its own, so it doesn’t help protect your kids and pets from accidents. 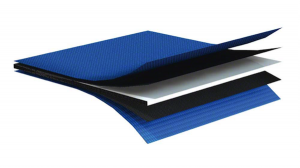 Thermal swimming pool covers are made from a lightweight foam material that helps regulate your pool’s water temperature and evaporation rate. In addition to keeping leaves, dirt, and other kinds of debris away from your pool water, thermal pool covers also block out the sun’s rays from reaching your pool’s water. A thermal pool cover helps prevent harmful algae and other kinds of bacteria from growing in your pool when you don’t use it for an extended period. 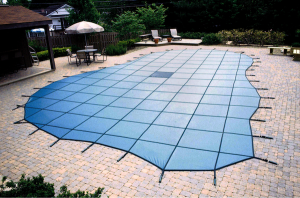 Just like solar pool covers, thermal pool covers are economical and can fit any pool size and shape. The downside of thermal pool covers is that you need to hire a professional to install this to your pool. This makes getting a thermal pool cover a bit more expensive than a solar pool cover. Another disadvantage of getting a thermal pool cover is that while it does an excellent job in preventing heat loss from your pool’s water, it is not able to heat up your pool’s water. That means that you will need to buy a separate pool heater if you want to keep your pool’s water temperature at a certain temperature. Of the four different types of pool covers, winter pool covers are the most popular choice among pool owners for several reasons. For one, it is relatively inexpensive and can be used for any pool size, type, and shape. They can also be used all year round, not just during the winter season. The biggest advantage winter pool covers have over the other kinds of swimming pool covers is that they are extremely safe. Winter pool covers are designed to be stretched on top of your pool and secured by anchors points. That means that they not only keep falling leaves, snow, and other debris out from your swimming pool. They are sturdy enough to support the weight of children and small animals, so you don’t have to worry about any unwanted accidents. Ironically, this benefit can also prove to be a setback for many pool owners using a winter pool cover. Since you need to attach a winter pool cover on these anchor points, it can be quite inconvenient to take on and off if you plan to use your swimming pool regularly. Winter pool covers are made from either mesh or vinyl fabric. Both of these don’t do a good job regulating your pool water’s temperature and evaporation rate. These materials also don’t help heat your pool’s water. That said, you will still need to get a separate water heater to get your pool’s water to just the right temperature. 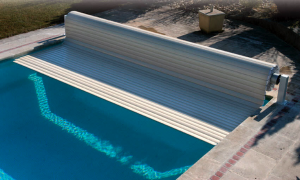 Unlike the first three kinds of swimming pool covers, automatic pool covers are made of interlocking slats that rest on the surface of your pool’s water. 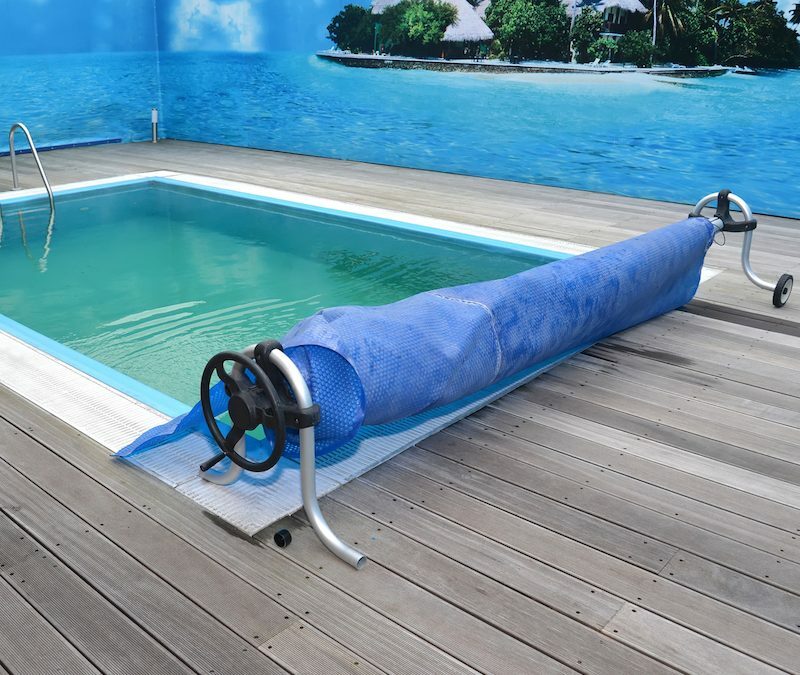 They are called automatic pool covers because they can easily be installed and taken off at the push of a button. In addition to being very convenient to use, automatic pool covers are the most secure and the safest to use if you have small children in your home. The interlocking slats used by automatic pool covers are very sturdy that they can support the weight of even adults, so you don’t have to worry about any unwanted accidents. Of course, this convenience and safety don’t come without a price. Automatic pool covers can be very expensive, which makes this one of the biggest disadvantages of opting to go for an automatic pool cover. Most, if not all, automatic pool covers are designed to fit rectangular inground pools. Professional pool cover companies can modify and customize automatic pool covers so that they can cover different pool shapes; they can become rather unattractive since some of the slats can extend beyond your pool’s edge. While it can prevent people from falling into the swimming pool, they may cause people to trip along the sides of your pool. Another disadvantage of getting an automatic pool cover is that it can only help regulate your pool’s temperature and evaporation rate. Automatic pool covers cannot heat up your pool’s water. Taking care of your swimming pool cover is just as important as your swimming pool itself. No matter how much care and attention you give to your swimming pool, if you don’t take the necessary steps to make sure that it’s properly cleaned and stored properly, it can cause it to get damaged and contaminated with mold, algae, and bacteria that could affect the quality of your pool. Just like with your swimming pool, the first step in caring for your pool cover is to get rid of any visible debris: fallen leaves and twigs, soil, and dirt. Gently scoop all of these out from your pool cover with the help of your pool skimmer or net. Only use a hose or a blower if you’re using an automatic pool cover. That’s because some of the debris that’s on the pool cover may have sharp edges, which can tear and damage other types of pool covers. If there is a pool of dirty water that accumulated on top of your pool cover, use a pump to remove this before taking off your pool cover. This would make sure that your clean pool water would not get contaminated. After removing your pool cover, thoroughly wash both sides with water and a mild detergent. Again, make sure that when you’re scrubbing your pool cover to do so gently to prevent any scratches and minute tears. Before storing away your pool cover, make sure that you properly treat this so that it lasts longer. For thermal, winter and solar pool covers, gently scrub diluted bleach on both sides. This would kill any molds, bacteria, and algae that may have started forming on your pool cover. Allow this to completely dry before storing this away in a cool, dry place. If you are using an automatic pool cover, use some Teflon-based spray to lubricate your pool cover and its different components to make sure that it keeps running smoothly all year round.